Yoga for Youngsters with fun themes! Kids will enjoy imitating the 21 Yoga Bear poses of animals and shapes which range from very simple to a little more advanced. Yoga is for everyone! It’s a non-competitive form of exercise that works the whole body. Yoga creates a state of healthy balance between mind and body. 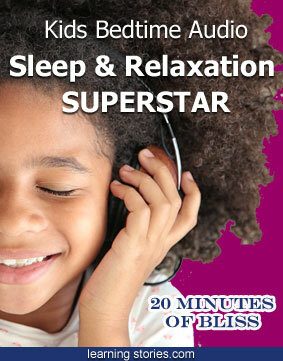 It creates a sense of well being which allows you to function at your very best! Yoga Bear works through the postures which run in sequence from a warm up to more active poses, with release poses in between to the warm down at the end. Each of the poses is presented in a two page spread. Cheerful illustrations engage the child in the fun and idea behind the pose. This is accompanied by a short text for parents to read aloud and a one liner on the benefits it brings. Mountain pose for example, strengthens the back and improves the posture. 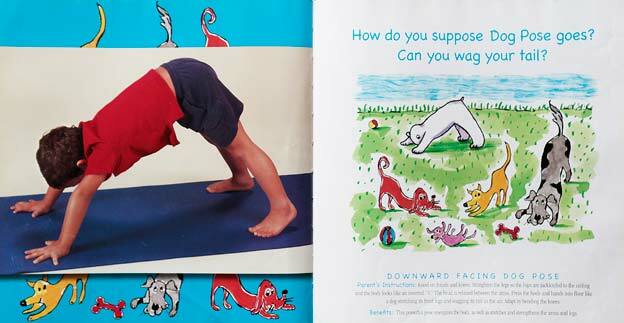 The opposite page has a bright clear full coloured picture of a young child demonstrating the pose. The ‘Dog Pose’ illustrations, show playful pups wagging their tails. Focusing on the ‘tail’ is a great way to draw young children’s attention to the place on the spine where bending and lengthening begins. The children pictured are happy and engaged in the postures. The phrases have simple rhymes adding to the fun of reading the instructions. The names of the poses have been adapted to resonate with kids. The pose of the child or leaf pose is the ‘Mouse Pose’. 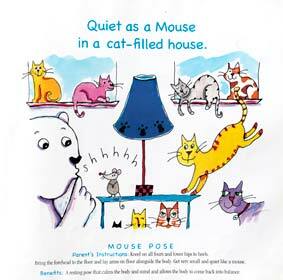 “Quite as a mouse in a cat-filled house” encourages the text! 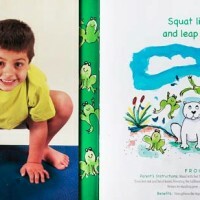 I tested this books appeal on a rough and tumble four and a half year old boy, who with very little instruction was able to do most of the poses. He was inspired to achieve what the kids in the photos were doing and was surprised that some of the poses were trickier than they looked. He wanted to do every pose in the book to check how ‘good’ he was! With practice and guidance this routine could be a cornerstone to early childhood strength, flexibility and fitness. Let’s face it even sporting hero’s have well designed warm ups and warm downs, a suggestion that may encourage even footy mad boys to gain the benefits of yoga. This book is not about creating the perfect pose! The best clothes to wear and non-slip floor surfaces are discussed in the introduction. Children with special needs may gain greater independence by practicing yoga. The many benefits include: Relaxation, coordination, improved concentration, assisting weight management and developing body awareness. Everyone could do with finding their inner Yoga Bear and Karen Pierce’s experience as both a qualified yoga instructor and fitness industry professional certainly provides a delightful, safe resource for kids and parents to explore. Publication Date: October 15, 2004.